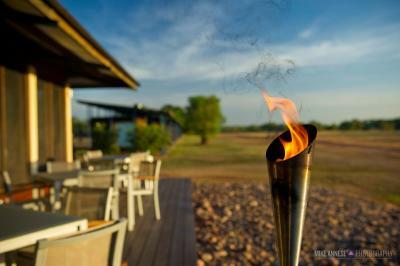 Lock in a great price for Wildman Wilderness Lodge – rated 8.6 by recent guests! 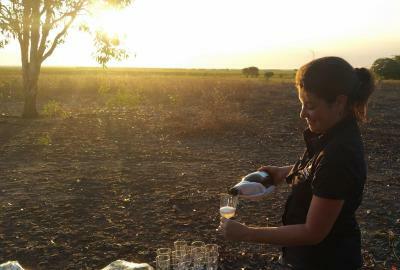 The setting was divine and the tours excellent. The infinity pool, although lacking sufficient shade, was a treat. 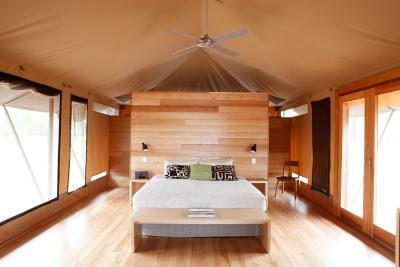 The tent cabins are well appointed. Staff were so friendly. Croissants were amazing. Scenic flight was epic! Everything is perfect! Staffs are very nice! Beautiful place to stay. We will come back again. 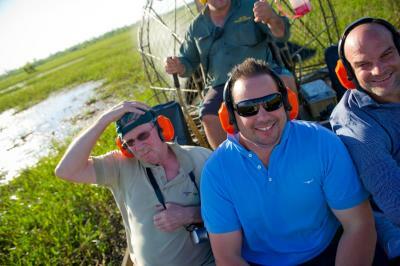 Loved it.....the location is amazing, we opted for an air-con cabin and it was worth it, as very hot. Enjoyed the pool, the food was superb....loved watching the wildlife just outside the door. 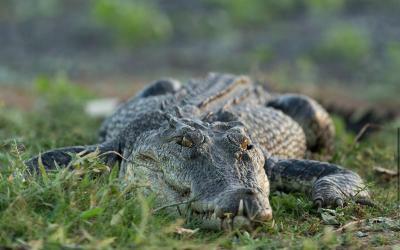 Wildman is located right in the middle of the wetland and is perfect for a number of activities such airboat or scenic fights. 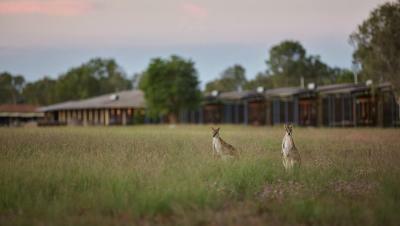 Beautiful scenery, a family of wallabies around, nice pool (although under maintenance the second day), beautiful rooms! Dinner was exceptional. Three course meal. Attentive, friendly waiting staff. LOVED the bikes and pool! Great stay. 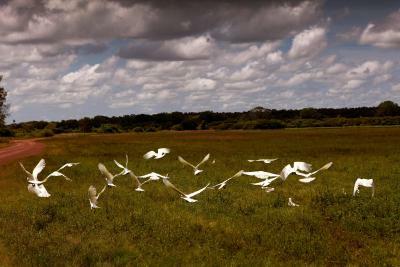 Lovely setting with lots of birds. 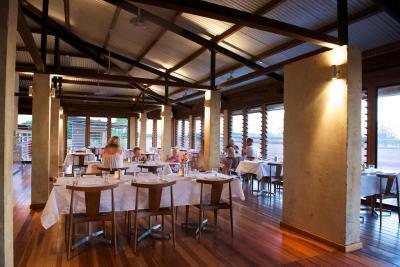 Great diners and friendly staff. 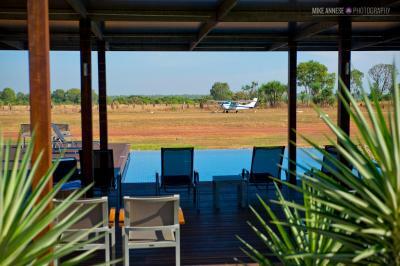 Wildman Wilderness Lodge This rating is a reflection of how the property compares to the industry standard when it comes to price, facilities and services available. It's based on a self-evaluation by the property. Use this rating to help choose your stay! 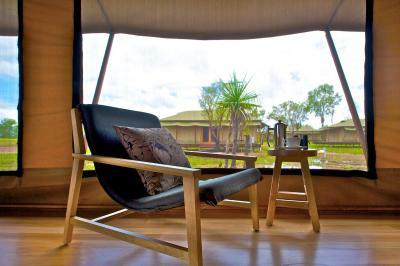 Located on the beautiful Mary River Wetlands, Wildman Wilderness Lodge offers a luxurious escape with stylish eco lodge and safari tent accommodations. 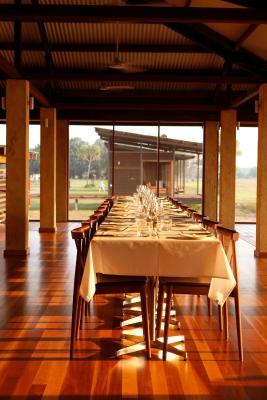 Guests can dine on seasonal Australian produce, including barramundi, buffalo and crocodile. There is also a diverse wine selection to accompany the menu. Picnic lunches can be arranged. 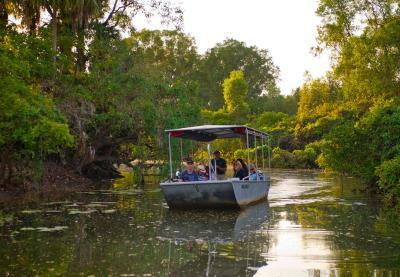 The tour desk offers stunning wildlife and birdlife tours, such as Mary River Wetlands cruises, Kakadu National Park tours and Leichhardt Point sunset tours. Private touring options are also available. 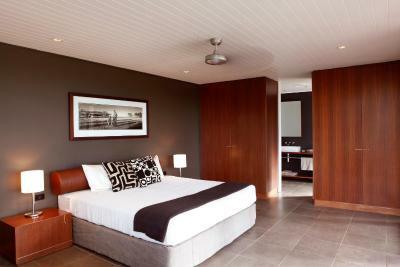 Each cabin provides air-conditioned comfort, with luxury bedding and premium furnishings. 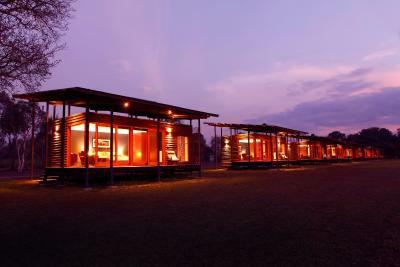 The tents are spacious, with natural colors and materials from the region to reflect the surrounding environment. 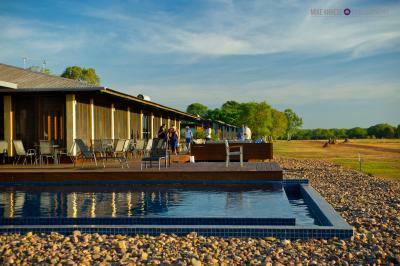 Facilities at the Wildman Wilderness Lodge Kakadu include a restaurant, bar, lounge, and swimming pool. 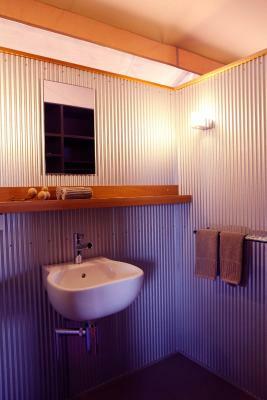 All room options feature private bathrooms. This property also has one of the top-rated locations in Point Stuart! Guests are happier about it compared to other properties in the area. 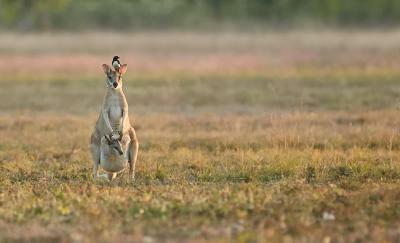 This property is also rated for the best value in Point Stuart! Guests are getting more for their money when compared to other properties in this city. 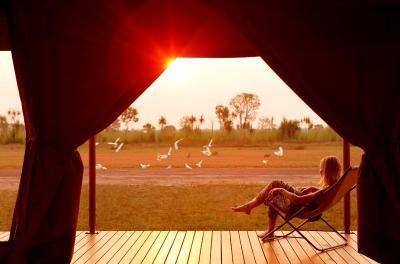 When would you like to stay at Wildman Wilderness Lodge? 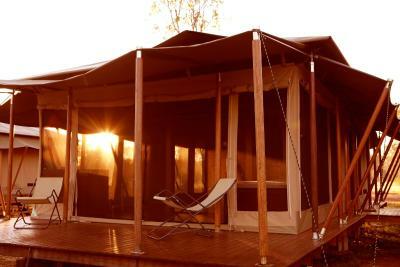 The spacious canvas Safari Tents are fan-cooled with a private ensuite, timber floors and luxurious bedding. 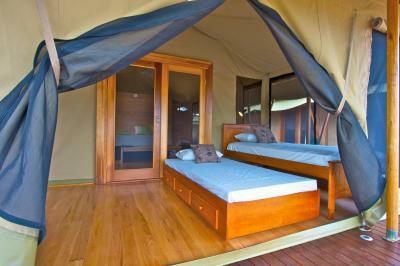 This air-conditioned, free-standing, premium lodge includes a king-sized bed and an private bathroom. 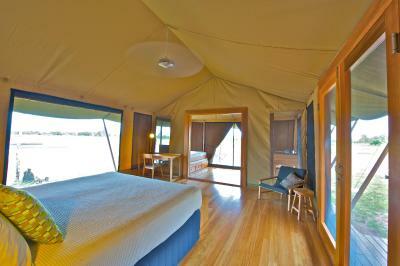 This spacious canvas tent features a fan, a private private bathroom, wooden floors and luxurious bedding. Please note that children's cots/cribs are available upon request. 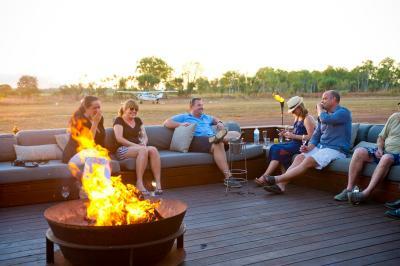 Wildman Wilderness Lodge is a fully recycled resort located on the wetlands of the beautiful Mary River in the Northern Territory. 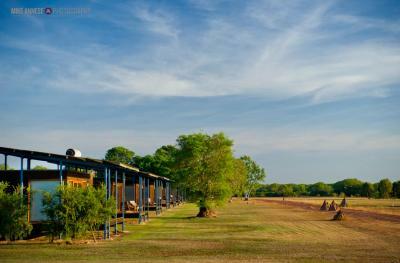 The resort started its life as Wrotham Park Station in Queensland and when it was no longer wanted on the cattle station property, it was then dismantled and trucked to its current location. 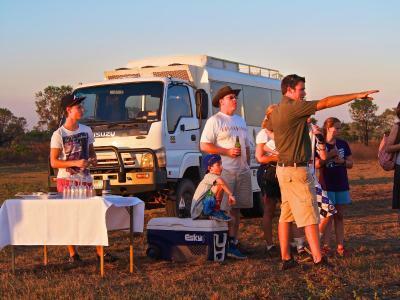 Wildman provides a brilliant contrast between the harsh Northern Territory outback, the lush and abundant wildlife of the wetlands and the comfort of premium lodge facilities. House Rules Wildman Wilderness Lodge takes special requests – add in the next step! Wildman Wilderness Lodge accepts these cards and reserves the right to temporarily hold an amount prior to arrival. If you have made a reservation and will be checking in with extra guests, please notify Wildman Wilderness Lodge in advance, using the contact details found on the booking confirmation. Please inform Wildman Wilderness Lodge of your expected arrival time in advance. You can use the Special Requests box when booking, or contact the property directly using the contact details in your confirmation. 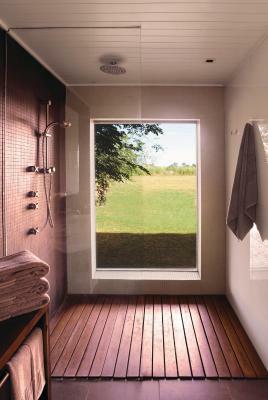 Pure luxury mixed with natural beauty. Noise pollution in the middle of the night! On the first night ti was a faulty fire alarm in one of the tents that went un attended from 4:30 am to 7:15, and the following night staff started blaring music at 05:45 am. Tent walls are thin!! Not even sure where to start from. The lodge is in the middle of nowhere so you totally rely on the hotel staff to arrange and suggest tours, and the staff I have to say was totally useless. The water is the pool is so dirty that it cannot be used. The room and bathroom was not clean as a 5 star accommodation should be. The morning after our first night I had to ask for the cleaners to come back as they did not clean the bathroom at all. 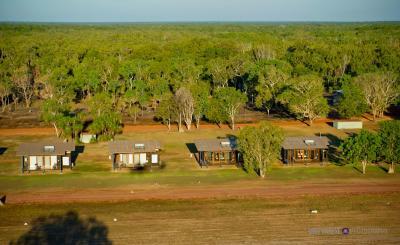 The ground around the lodge is very dusty and they should really pay more attention in maintenance. Another big disappointment was the food, again you are in the middle of nowhere where the closest city is 2 hours drive away, and they offer the same menu for each meal. Breakfast was super pour. The owner are present in the lodge, but you feel like they are just after your money and really don’t care about offering you a nice experience. Really too expensive for what it is, absolutely not worth it. Unique location and sleeping experience. Receptionist was on the phone when we arrived and kept us waiting for very long time. We were allowed an early checkin which was great, but disappointed with initial reception to Wildmans. 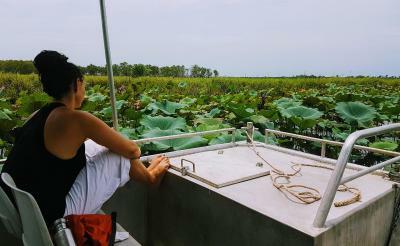 Was further from Kakadu than I thought. Breakfasts were fairly ordinary.